"Looking back, we didn't have pegs to show our photographer that this is how we want our pics to look like. We did not imitate or copy certain poses because we are not models but we want to be artistas haha. When all the pictures came out, we realized we can make a story out of it, so that's how we present our prenup pictures now, a picture book story of how we ended up living together. The whole day will be something that we will never forget and something that we can share with our future kids." Sumakay ng tren, at nagtanan! Nakita nila ang ferry station, pero sarado pala. Kahit mag makaawa pa sila. Pero wala pa itong biyahe. Sumakay sila ng pedicab pero di sila kasya. Pero ayaw umandar ng kabayo! May nakita silang jeep, pero ayaw mag sakay! at nag HI kay Jollibee. Nang may makita ulit sila na bus! At sila ay naging masaya dahil uuwi na sila nang magkasama. Tin writes: From the beginning, we both knew that we didn't want to do the traditional shoot wherein the photographer will tell you to look at your fiance longingly. First, I can't do that without bursting into laughter and two, we don't really do that in real life so why would we want ourselves to be immortalized in such poses? We finalized the concept of our shoot a few weeks before the arranged schedule, we wanted to tie together our wedding theme (Manila) with our prenup shoot but not too literally so we shot it at different places in Manila where other people haven't really done a shoot yet. We also decided that our focus was on transportation so we decided on Paco Railway Station, the ferry terminal near Jones Bridge and Lawton where there are a lot of terminals for buses, jeeps and fxs. Marvin and I have been together for 8 years now and before we could drive, we spent most of our time in these vehicles traveling from Cavite to Manila. 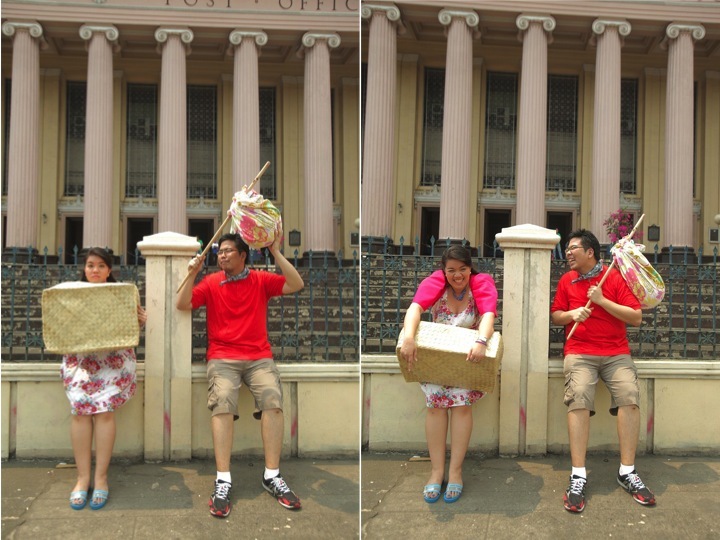 We also wanted to put focus on some beautiful buildings such as Manila Post Office and Manila City Hall. For the outfits, we wanted to do Filipiniana but with a modern twist without blowing big bucks. I asked my entourage designer Boy Kastener Santos to make a terno bolero for me in hot pink that I can put over a more modern day dress. I bought P50 colored bakya from our palengke here in Cavite. Marvin already had his straw hat so we just bought a red camisa chino and a scarf to tie around his neck (ala probinsyano). For props I was dead set on using a giant tampipi which we sourced from Quiapo (ilalim ng tulay). A couple of days before the shoot, I thought of adding another element to our shoot, "Tanan" or elopement. it further solidified our Pinoy theme because no one can do elopements like Pinoys do it (as attested by all the movies I've seen before where the couple decides "Magtanan na lang tayo!"). We added the stick with the blanket to add "lumayas" factor. To give characters to our shoot, we decided to be prom kings and queens but to make it Pinoy I made sashes that said "Brgy. Mr. Pogi" or "Mutya ng Baranggay". We used formal wear that we already had at home and just bought kid's crowns to solidify our "titles"
It really disappoints me and most especially our photographer that there are so many nice places around our country but in order to shoot you have to either pay or go through all the government red tape to secure permits. We couldn't shoot that long at Paco Station because the guard was breathing down our necks the whole time even if the next train is not due for the next hour. The other places are so much better since the guards, drivers and bus conductors are more than willing to accommodate us. We just had to ask nicely and they gave us free reign to do what ever we want. People should be more accommodating to photo shoots because this in effect will showcase great places in our country without the expense of advertisement or marketing! Another challenge is when shooting at a very public location, people are going to stare, watch, shout (Prinsesa!) and basically become major usiseros. Going into the shoot I had my game face on and decided that I will ignore them and will just have a grand time throughout the shoot. If someone called out to us we would wave at them. Whatever our photographer asked us to do, we did it and with panache. When he asked us to run, we ran and the fun and happiness showed in our faces. It was also suuuuper hot that day. It really helped that we availed of the prenup personal assistance service of our make up artist, Val Villarin. Looking at the pictures you wouldn't have thought that we shot the pictures from 11am to 3pm on a hot April day. Trust your suppliers, before the day of the shoot, Marvin had second thoughts about how our shoot would turn out, that people would find it corny but in the end, pictures turned out soooo much better than we expected. Super thanks Kai and Mica for putting up this Blog! It's a great feeling to know that I am not alone in this world with all this wedding craziness. Will send you more emails about the wedding soon. 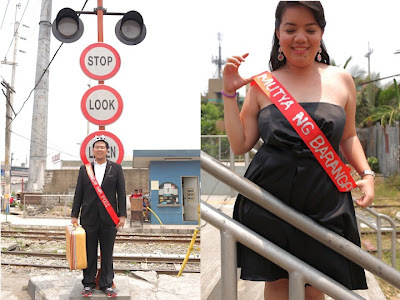 This was truly a very inspired, rebellious, and fun prenup shoot! We particularly loved the fact that this couple culled their ideas from within, and not from other people's own prenups or pegs. Slow clap for Tin and Marvin! Rebellious Couple, indeed! Nice. This is one of my favorite post thus far! Ang galeng! Not only the concept but how it was featured. Two thumbs up for the rebellious brides! I wish i thought of this! Ang kulit lang! Haha!